Presentations are one major activity in each and everyone's career. There are different ways of presenting your information, some does it just by showing the static data and some wants to do it with the Live data. We are the people who are of type 2, presenting the live data. But when it comes to presenting live data, it is through reports. How beautiful it will be if we have the option to interact with the Live data from a PowerPoint Presentation? 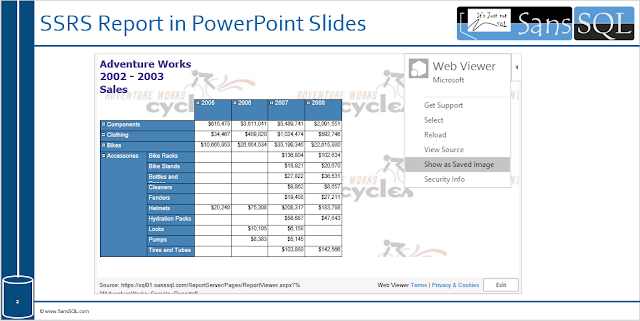 In this post, we shall learn how to embed SSRS report into PowerPoint Slides. Open a PowerPoint Presentation, go to "Insert" Tab and Click on "Store"
Now search for "web viewer" add-in and Click "Add". This is an add-in from Microsoft. 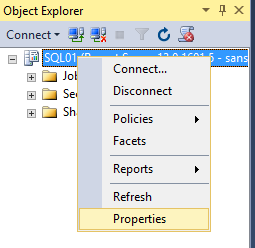 Now Insert your SSRS Report Server URL into the URL box and hit "Preview". And that's it, Now your Slide will Load the data from SSRS Report. Now you can interact (Drill Down or Drill Through, etc...) with the data depending on the report type. If you want to show a static image, then click on the small left arrow on the top right of the add-in and choose "Show as Saved Image" and this is display the data in the image format. Now your presentations will be more fun with the Live Data. Enabling Remote Errors includes external error information (for example, error information about report data sources) with the error messages that are returned for users who request reports from remote computers. By default the remote errors in SSRS is set to false, which means error messages in a multi-server environment are not detailed. Right-Click on Report Server and Choose "Properties"
Navigate to the "Advanced" Page and set the "EnableRemoteErrors" to "True" and Click "OK"
Note: If you modify the setting in the database, you need to restart the Reporting Services service before the changes take effect.